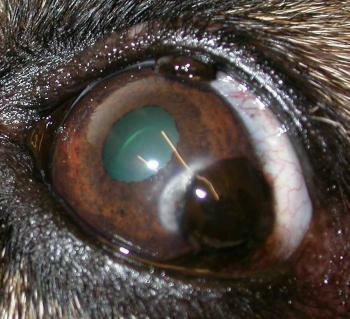 An 8 year old female neutered German Shepherd Dog is presented to you with this appearance of the ocular surface. What is the black mass likely to be and what is the white curved lesion next to it? What treatment would you suggest and what is the prognosis for the eye and for the dog more generally? The black mass is a limbal melanoma, more commonly seen in German Shepherd Dogs than in many other dog breeds. The white curved line is an arc of corneal lipid. The edge of the melanoma forces the corneal collagen lamellae apart allowing lipid to enter the cornea. Sometimes this is associated with raised circulating lipid levels, but not in this dog. Surgical resection by superficial keratectomy is the prefered therapeutic option. Cryotherapy of the bed of the corneal ulcer thus created is advised as melanomas are exquisity cryosensitive. It can be difficult to achieve adequate surgical margins in the depth of the cornea (a good reason for operating early in the genesis of the lesion rather than leaving it until later) and local recurrence is possible but these melanomas do not metastasise and the lesion is thus not life-threatening. Note the other similar but smaller more dorsally at the limbus – this should also be resected. This entry was posted in Cases and tagged Corneal lipid arcus, dog, Limbal Melanoma. Bookmark the permalink.